This section includes articles written by members of our community related to any topic connected with USEC's mission, everybody is invited to submit proposals through our Contact page. The opinions expressed in these articles are those of the corresponding authors and do not necessarily reflect the view of the US Spain Executives Community, who assumes no responsibility or liability for any errors or omissions in their content. 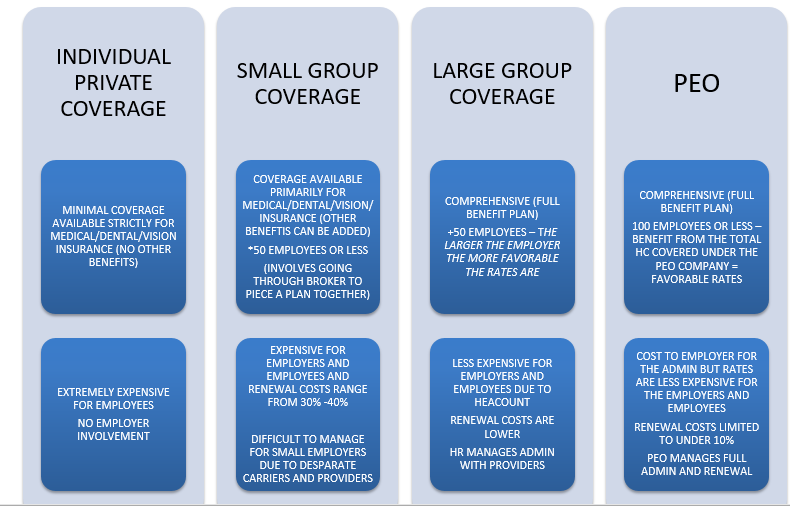 Employee benefits (particularly medical coverage) are privately funded in the United States. The US Government does not provide non-government or non-unionized employees benefit coverage outside of unemployment, welfare (for those with no employment and no income), Medicare (public medical coverage for old age and eligible no income residents) and Social Security (retirement funding paid after age of 65 and disability). Although the US Residents pay taxes for Medicare and Social Security these benefits are realized in situations of loss of employment, retirement, and disability. This is the main reason for the health crises debate that exists in the United States. In short, if you do not work for a company that can afford a formal Private Benefit Plan/Package you have little to no protection and coverage. Employers should and need to offer Benefit Plan/Coverage to attract employees and talent. Although benefit plans are costly and not legally required for small employers, majority of prospective employees will have benefit coverage as a requirement for their employment with an organization, particularly in the Financial and IT sectors. What are the options when it comes to finding a benefit plan and securing coverage for your employees? If you are a foreign company looking to employee local US employees and have anywhere from 1-100 employees with limited experience with US HR and Benefits, a PEO solution, though costly, is often the best solution. How do you elect a benefit plan? How does cost breakdown? A typical Benefit Plan/Package has benefits that are the Employee Funded (deductions are managed via payroll) and Employer funded. Some Benefits are typically 100% Employer Funded (Life Insurance, Disability and ADD). The full Employer and Employee amount comprises 100% of premium that is due to the Benefits Carrier. Typically, the Employer will pay for 70%-80% of the premium and Employees will pay 20-30% of the premium. Premiums all depend on the carriers, plans elected and rates that are obtained (in many cases the employee demographic will impact rates as well). The plans offered not only provide employee coverage but also spousal and child coverage. The cost of the benefits varies significantly depending on all of these factors. Below is a sample view of the employer and employee costs based on a sample plan. Per the above, depending on the whether the employee seeks coverage for only self or for self and family, the Employer Portion of the costs varies significantly. It is important to do your research and review your options to ensure you secure the best plan and arrangement for your organization and for your employees in the US. (Español) ¿“Duty Free” en España para españoles?